After visiting the Epilady booth while at the Housewares show and seeing their online Hautelook sale, I had wrote here that I was going to try using an epilator and review it for ya'll. An Epilator is like an electric shaver, but instead of just trimming the hairs it plucks them from the root like a tweezer, thus it's like an electric tweezer. Tweezing in general isn't that much fun and can cause redness, which was the case here too. However, the redness was just temporary and I actually had more redness and bumps from shaving in the past, while the epilator left me as smooth as a baby within a few hours after using it and applying lotion. As some of you mentioned previously in my comments using an epilator does hurt, especially in the bikini area, but you do get used to it the more use it and it's fleeting. Also, since it grabs the hair from the root, it allows more time in between till you have to use it again, just like waxing, but in the privacy of your own home and for less money. Epilady products are around $50 to $75, thus eventually it is less than paying $30 plus tip for each bikini wax. Also, supposedly hair grows back more slowly, and diminishes over time and new hairs grow back softer and lighter. I have noticed the time claim, but have to continue using longer to know for sure. Tips for using an epilator: take a warm shower prior to epilating. What this does is open your pores up and will help reduce discomfort and make epilation more efficient. After epilating, do not apply any creams or lotions until about an hour later. This is because your hair shafts are open and when creams are applied, it clogs up these shafts. This may lead to ingrown hairs. You also have to make sure you're holding it at a 80 degree angle and not straight on. 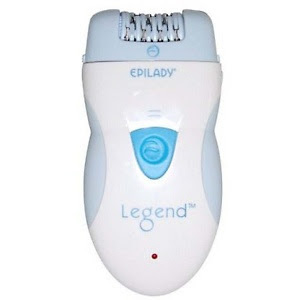 The cool people of Epilady that I met at the Housewares show are actually allowing me to hold a giveaway for an Epilady Legend -Rechargeable Epilator worth $74.95. This product may be used on the arms, legs, underarms, bikini, and face, comes in two operating speeds and includes adapter, cleaning brush, carrying case and instruction manual. To enter, comment here about why you'd want an Epilady. Please don't forget to leave your email address in the body of your comment or link back to a blogger profile or website that actually has your email address on it. For extra entries tweet this giveaway. Ends Wednesday, April. 21. Good luck! Update: Congrats to Jill! I am a full time working mommy and I am always last on the list. I love my family but sometimes IT HAS TO BE ALL ABOUT ME. The Epilady sounds perfect and I will have one less errand to do. Are you kidding me?! You're giving this away!?! I think I must've gotten some weird gene that makes hair grow back at alarming rates. Seriously, I can shave legs/underarms, and the very next day it's already there. :( I'll do anything for it to slow down, but waxing costs too much overall. I love epilation. It saves me time and money but I am not a fan of Epilady. I find their products to be uncomfortable. I switched from Epilady to Emjoi a few years ago and have never looked back. Emjoi epilators have more tweezers so I’m finished my hair removal chore faster and I barely feel it. I just upgraded from the Caress to Emagine and it is a dream. Tons of tweezers so my legs and arms are smooth in under 20 mins. I want it because I'm getting married in September and am going to warm places for my honeymoon! ok so my mom had an OG epilady in the 80s but it all just went over my head, except the hurts like heck part. well, now that i'm older...errr, more mature...i would LOVE to have one! I would love this. I am busy, so not having to shave every morning would be really nice. I've always wanted to try one of these because I have super super sensitive skin and EVERYTHING irritates it. Especially shaving. Waxing sometimes does too. This is fabulous! I hate hair thats in places other than your head! Thank you. I would love to try the Epilady I want to steer away from razors or creams. I remember when I was shaving for the first time and my mom said how much I would hate it soon...my mom's always right. I'd love to win this giveaway! i would love to win this because i HATE shaving and waxing is either too messy, too time consuming, or causes irritation to my sensitive skin. This would be perfect! I want to win because I must be one of the few people left on earth who has NOT ever tried an epilator! I want to find out for myself if it really does make your legs smoother for longer. It has been my dream for years! I must win it! I would love to win this, because I live in South America, where it's summer 10 months a year. I'm so sick of shaving my legs and bikini area, and would love to try an epilator. Thanks! i was waxing for a while, but it just got too expensive. to be able to do that at home would be wonderful! When we bought our house I had to give up my monthly wax appointment. :0( With summer coming up I could really use this, I hate shaving! It would be wonderful to not have to shave EVERY day. Hopefully it's not too painful. I'd love this because shaving irritates my skin, and takes too much time. This would be faster, last longer, and it sound like it would be easier on my legs, too. I would love to try an epilator! I hate shaving every day - my hair grows back super fast and it's annoying having to shave that often! I had an epilator and would love one that I didn't have to be attached to a wall to use! I'm scared, but want to try this! two words: bikini wax! I'm petrified to get it done, would love something that would not have to make me face my fear! "@tarametblog has an Epilady review and giveaway!!! go 2 http://tinyurl.com/y4fepzz to enter... ladies the sun is shining = skirts & dresses"
I still just shave because, waxing or purchasing one of these has always seemed like an indulgence that I couldn't justify to myself. Even though I loathe shaving! I actually used the original Epilady when I was in my early teens. I would love to experience the newest incarnation. Here is my e-mail: berkana[at]fastmail[dot]fm for the post above! Oh, I've been wanting one of these! Especially because my bachelorette party on a cruise is coming up. Great giveaway. I'm curious to try this and see how well it works! Although it does sound like it may be a wee bit painful. I've tried an epilator once, but I'd like to try one again!